That’s the number of spots for starting pitchers that are available when the minor league season begins on April 4. So, I sat down at the old spreadsheet trying to figure out how to take those 22 and begin to narrow it down to 6 guys for this preseason all-star team. Yeah, it was not very easy. I hit up my friends John and Cory for their top 6. They weren’t even close to each other. This was going to be tough. At one point, I thought of having starting rotation A and starting rotation B. After I thought about it for 15 minutes, that is what I did…for 15 minutes. Just to get to 12 was excruciating and I then I realized I left out three other guys. So, I had to go back to the old drawing board on Google Sheets. My next brilliant idea was to divide it by AA and AAA vs. A- and A+. That didn’t work out so well either as I had 13 guys. I only needed six but my brain couldn’t understand itself. So, I said to myself, “SCREW IT!” and I went with just 5 arms. These five are head and shoulders above everyone else. The depth the Cubs have is so good, most pitchers haven’t separated themselves from each other. All the honorable mention guys have an argument to make that sixth spot. Here is what I came up with for my first half all-star squad for pitchers. Duncan Robinson – Great command and control, excited to see him at Iowa all year. 1 year away..
Matt Swarmer – While his fastball is ticking up, his offspeed is other worldly. I am glad to see him start at Iowa to begin the year. Corey Abbott – I love his tenacity on the mound in that he never gives in. Probably the most competitive pitcher in the system. Brailyn Marquez – In terms of a pure fastball, he arguably has the best in the system. Now, let’s see him learn how to use his other pitches efficiently to get him deeper into games. He only saw the 7th inning once last year. 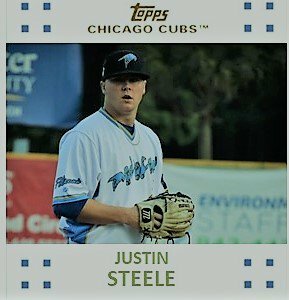 Justin Steele – His 2018 season was a bit awe-inspiring coming back so quickly and so dominant from TJS in late 2017. Back up to 95 mph, 2019 will see him using that fastball and a plus curve to attack hitters. Now on the 40 man roster, his first full season back should see him be even stronger than he was last year. I am little giddy to see what he can do at AA. But first, he’s going to stay in Mesa until he is fully stretched out. Honorable Mention Starters– Yovanny Cruz, Trevor Clifton, Thomas Hatch, Alex Lange, and Keegan Thompson. All five of these arms could very well have been the sixth man in this list and would have had a good argument to do so. Of them, Cruz currently has the most upside and has been reportedly cranking it up to 95-96 at times in spring training. If that is true, he is easily going to be the breakout arm of the first half. Riley Thompson, Derek Casey, Faustino Carrera, and Erling Moreno. Outside of Moreno, this should be most of South Bend’s starting staff. I am excited to watch them throw every night. Thompson is a kid who I almost put in the sixth spot. The Wild Card – Jose Albertos – I still love his pitches. Hopefully, he can put everything back together this year and be a dominant guy on the mound. He should probably start in EXST to begin the year. Bailey Clark – He just has to stay healthy. He has everything he needs except experience in the upper levels of the minors. He looks like he is going to be doing piggyback starting to begin the year to keep him stretched out a bit. Brian Glowicki – He didn’t allow a run the last six weeks at South Bend. He’s a bulldog out there. Dakota Mekkes – I will get him a ticket to Chicago. He’s ready. James Norwood – Just biding his time while waiting for his chance. Garrett Kelly – I am pulling for this kid to get even better after an off-season in the system. Manny Rondon – He just kills lefties and I am ready to see him do it full time from the pen. Three Sleeper Relievers to Watch: Sean Barry, Ethan Roberts, and Riley McCauley are three back of the bullpen guys who will be doing so at South Bend. They all have experience in the past year at Eugene and/or in college. Seeing who is best fit for what role could take some time as all three adapt to the rigors of pitching in the Great Lakes region in April. Alzolay can’t seem to stay healthy while Oscar was suspended in an attempt to stay healthy. I will join everybody else in hurrying up and waiting for them to get it together. According to Arizona Phil, Osar is going to stay stretched out as a starter in EXST for when he returns from his suspension in late May. I thought I would share with you some things I would like to see happen in spring training. Aside from the usual health related takes, my thoughts run the gamut from MLB players to MiLB prospects to player movement. Now that the green grass of Arizona is being cut and the sprinklers are being shut off, it’s time for real things to happen in real time. 1. Dingers Early and Often – I want to see Kyle Schwarber, Kris Bryant, Javy Baez, and others get into a groove and start damaging baseballs at a nice solid pace. I dig the home run. There are those who say the triple or the steal of home is the most exciting play in baseball. They are wrong, it’s the dinger. The Cubs ability is crank balls out of the yard is going to be influenced by the tutelage of new hitting coach Anthony Iapoce. I am excited to see these young hitters just be themselves again in 2019. 2. Dakota Mekkes – I could add early and often to his tag. He’s ready for his shot at the bullpen. When it comes to spring training, he should get in games early in the first few innings to see how he does against MLB hitters. I don’t want to see him against other minor leaguers in a spring training game, I’ve seen that movie. Give me something new. 3. The Pentagon of Pitching – Lester, Hendricks, Quintana, Darvish, and Hamels – That is easily the best five-man rotation I’ve seen the Cubs trot out there in my lifetime. I am looking forward to how hitters respond to being punished every day. 4. 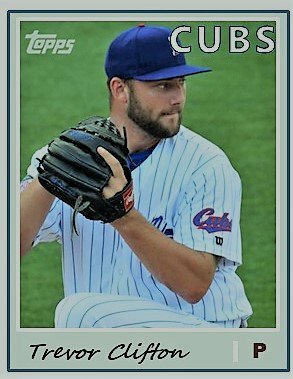 Split Squad Pitching – I am curious to see which Cub minor leaguers get starts in the split squad games. Adbert is one as will be Duncan Robinson and Alec Mills. Will Trevor Clifton get a few innings in along with Keegan Thompson, Matt Swarmer, and Thomas Hatch? It will fun to take in just exactly who the Cubs throw and value enough to test them out. 5. Arizona Phil Rosters – The man from the backfields is going to have to be my eyes and ears for a bit as he fills in who is playing with which squad this spring. It should be eye-opening to see who gets assigned where and for how long. 6. Nico at Second – This will be must see viewing when it occurs. It could take place on the backfields or at Sloan Park. I don’t care. I just want to examine how he does. I want to see how he pivots, what kind of zip is on his throws, how he tags, and how he sets up the shortstop. Strange that I didn’t even mention his bat. 7. Duncan Robinson and the Curious Case of the Scouting Reports – What most people don’t know about the minors is that pitchers don’t get MLB style scouting reports. I wonder how having a multitude of information will impact how Duncan Robinson performs. I’m pretty pumped to see how he pitches in late March rather than early March. The reason for that wish is to see him work through a MLB order a couple of times. 8. Out of the Pen – Two arms I would love to see get some MLB licks in on the mound this spring after Mekkes are Alzolay and Michael Rucker. Both are quite different pitchers on the surface. But they do share one thing in common, they both attack hitters. Neither is going to make the big league squad, but that doesn’t mean they can’t audition for a role later in the year. 9. Where Trent Giambrone and Zack Short Play – Both are very close to being ready for their shot in the majors. Both could be a utility type of bench player, but both should playing all over the infield this spring. 3B, SS, and 2B will be their spots, but with how much frequency will they get in games throughout the spring? 10. Pictures – Yeah, I am ready to make some baseball cards. In fact, I am pretty pumped about it. I have one new template this year, but that’s not going to stop me. Which Prospects Will Get Looks in Big League Camp? The Cubs are going to issue a press release here in a few days. That release will contain a few names that the team is going to invite to spring training. These players are known as NRIs or non-roster invitees. I keep thinking what that list might look like more and more these days, especially since the convention. The White Sox and a few other organizations have already put out their lists. The Cubs will follow suit any day. All current prospects on the 40 man will be in camp. So, Adbert, Justin Steele, and Mark Zagunis will be there. In looking at other possibilities, the Cubs are going to basically fill out 2 teams for spring training and slowly whittle about 60-70 players down to 25 by the end of March. In the big scheme of things, the Cubs don’t have to send out invites to players. For some prospects, it’s a reward, for other players it might be a contractual thing if they don’t stick with the Cubs when spring training is over. That way, many AAAA-type guys can get seen playing in the spring. As for Cub prospects, there are several who should be playing in a packed house at Sloan Park throughout March. Trevor Clifton, Duncan Robinson, Thomas Hatch, Keegan Thompson, Alex Lange, Cory Abbott, Michael Rucker, and Matt Swarmer are some definite names who should get the call. They could all be piggyback starters as the big league Cubs get stretched out. As well, the Cubs could also get to see how the pitchers fare against big league hitters in those crucial first two or three innings or in split squad games. The bullpen arm I want to see most in the big league camp this spring is Dakota Mekkes. The 6’7” righty has a deceptive delivery to go with an elongated stride thanks in part to his large frame. It has worked with great results at every level in the minors so far. I want to see how he does against MLB hitters. As is the case in every spring training, the Cubs are going to need lots of catchers. Miguel Amaya is one guy I want to see get some MLB time in Mesa along with Jhonny Pereda. Both guys have very different hitting profiles but are both very solid defensively. Ian Rice and PJ Higgins should also get the call for the first couple of weeks. I am pretty sure Nico Hoerner is going to get a lot of looks this spring at both second base and shortstop. The Cubs are going to give Nico a preview of what he could be seeing quickly. 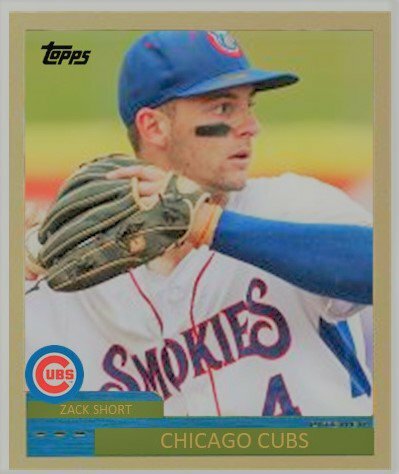 In addition, Zack Short could be a guy the Cubs want to get more ABs against MLB arms to see how Short’s amazing approach works against big league pitching. As well, Jared Young,Trent Giambrone, and Luis Vazquez will see action, but whether they get invites is up in the air. I would also love to see Luke Reynolds get some swings in as well. However they get in the games doesn’t matter. They should all get into games to show what they can do. As we saw last year, the Cubs had several young guys get looks from time-to-time throughout the spring. Fernando Kelli played in two games despite not being a NRI. I would love to see Nelson Velazquez get in a few games to practice laying off breaking balls out of the zone. Considering the quantity of AAAA players the Cubs signed this year, the list of NRI should be somewhere around 20 and be pitching and catching heavy. I don’t expect to see a lot of position players except middle infielders. Hopefully, the list should be out today or tomorrow. Next Week – Podcast #2 – If you have topics you want me to talk about, send me a tweet. As usual, I’m going to split the right-handed starting pitcher system evaluation into two posts. Last year, it was a number ranking thing where I had 12 to 7 in one post and then 6 to 1 in the other. This year, not so much. I decided to split them up into the top two levels of the minor league system and then Myrtle Beach on down. Rankings be damned! This post will look at exactly who the top arms are and who should be throwing at Iowa, Tennessee, and hopefully Chicago in 2019. 1. It all starts with Adbert Alzolay this year. Even though he missed three months in 2018, he still had a lot of impressive moments at AAA. While technically still a starter, I would not be surprised to see him in Chicago as a reliever at some point this summer. 2. Trevor Clifton looks to be close to being ready for Chicago. His efficiency to get deep into a game is what’s going to keep him a starter in the majors. The same movement that he got on his curveball has now been added to his changeup, and his fastball continues to have good armside run in on a right-handed hitter. 3. Cory Abbott is the best pitcher the Cubs took in the 2017 Draft. He dominated two levels in 2018 at South Bend and Myrtle Beach. It took about 2-3 weeks for him to make adjustments and then it was on. It is not unreasonable to think he could he do the same in 2019. 4. For Duncan Robinson, he has the efficiency that Clifton is looking for. His second half was amazing at Tennessee and that earned him 2 starts for Iowa at the end of the year. The 6‘6“ righty out of Dartmouth has pushed himself to to being a guy the Cubs might consider for a spot start this summer. He did it all in a little over two years. Look for him to take the bump a time or two in Mesa with the big league club this spring. 5. Matt Swarmer’s 2018 is a kind of Hollywood type story. The big gangly kid added some muscle and some miles per hour to his fastball and everything just clicked. Now he’s able to throw 92 to 94 with a vicious curve and a wicked change. I don’t know if he starts in Iowa to begin the year or in Tennessee. Either way, he is not that far away. 6. Michael Rucker is my guy. I think in the long term he might be a reliever because his stuff plays up a bit out of the pen, but when you throw 70% strikes, that turns a lot of heads. 7. Tyson Miller took off last year at Myrtle Beach and should be at AA to start 2019. If he continues adding onto his rather large 6‘3“ frame like he did last year, his stuff could tick up even more. It was fun to watch an arm who had gotten through the lower part of the system by using his command and control to have some added fire power with the same command and control. I’m excited to see what happens with him in 2019. Still watching – Keegan Thompson looks like he could be a guy as he dominated high A Myrtle Beach. He was somewhat inconsistent at Tennessee but at times he was good. As well, I hope the Cubs can get Alex Lange on track. He has 2 plus pitches and a pedestrian fastball. If he could get his fastball to have some movement, he could get going upward. Lange can get teed up or he could strike out 10. You never know. Then again, Lange finished very strong in August with a 2.74 ERA for the month with opponents only hitting .160 off him. I’d like some more of that Alex Lange, please. Sleeper – Thomas Hatch – Whatever happened to him in August, whether it was something he ate or drank or changed, needs to continue next year. He was a freaking beast on the mound with a 2.51 ERA in 5 starts, his best month at AA. I hope he can begin 2019 like he ended 2018. When Oscar de la Cruz’s suspension ends, it will be intriguing to see if the Cubs stretch him or put him in the pen. His injurious past affected the suspension and putting him in the pen might kill two birds with one stone. It is going to be a fun year for watching pitching at Iowa and Tennessee. After the GM meetings this week, I was not surprised to see the Cubs not make a move to add to the back end. Considering the injury concerns of Brandon Morrow and Pedro Strop, that type of recurrence is on the minds of most fans looking at the bullpen. Who can the Cubs put in the pen to assuage such fears from running rampant? There are a lot of options from free agents Andrew Miller or Zach Britton to the Cubs’ very own prospects. If you look at that depth chart on Cubs.com, the pen seems set in terms of numbers. Then again, Morrow, Strop, and Duensing are coming off injuries, Carl Edwards, Jr. is coming off a walked filled year. Cishek and Rosario were the highlights of the pen last year, along with the departed Jesse Chavez. Mike Montgomery should be joining them and Alex Mills was surprisingly good in his turns. As for Kintzler and Chatwood, they do not inspire many. Right now, there’s just a lot of uncertainty with regards to health, performance, and age of the arms on the roster. In trying to look ahead to the makeup of the bullpen for 2019, I’m starting to get the feeling the Cubs are going to wait and see what they have come May and June. Then, they could go out and make a move for an arm before the trading deadline. That makes the most sense in terms of talent, availability, and, surprisingly, dollars. The Cubs stashed a few guys down at Iowa already. 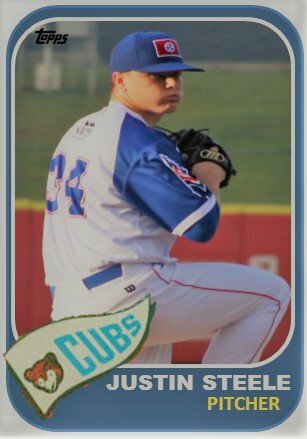 Rowan Wick, Jerry Vasto, and Conor Lillis-White are three new guys the Cubs have added this offseason for depth. Whether or not the Cubs will use them is up in the air. The wait and see approach could open the door for some of their own prospects. To be honest, I’d like to see what Adbert Alzolay can do out of the pen in Chicago. 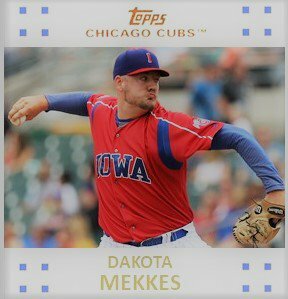 I’d like to see Dakota Mekkes get a shot in the majors. Add in James Norwood and Dillon Maples and you have four talented young arms from which to choose and to use. When the Cubs went hog wild on pitchers in the 2016 and 2017 drafts, I thought it might take four years for them to get through the system. Instead those arms are going to be close to ready in 2019. Thomas Hatch, Duncan Robinson, and Michael Rucker are all set to begin next season at Iowa. Rucker’s stuff plays up quite a bit out of the pen and with his ability to throw strikes at almost a 70% rate, he might be the most appealing of these three for a bullpen role. Part of me says just throw them out there and let them have at it. When I look at Theo, though, he can’t be happy. He is going to get something done. 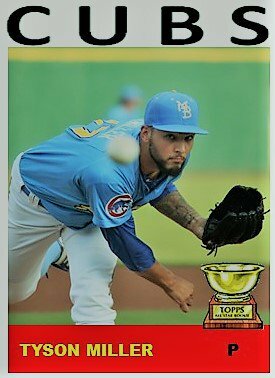 While free agency is an option, a trade might make more sense to get what he wants as the Cubs do have plenty of MiLB pitching depth to use as assets and they do have a few bench players they could use in a deal. Sitting on a deal might work in the short term. But come June, Theo will want the bullpen solidified for the stretch run. In today’s mailbag post, I am going to kill two birds with one stone thanks in part to two queries about pitching. David Spellman asked, “Any pitching help for the major league level on the horizon?” In the same post, Jason Anderson wondered, “How is @adbert29 rehab coming? When will he be back? Where do you think he starts his season? Could he see time with the big league club next year? Possibly in bullpen?” Luckily for me, the two questions kind of share a common component. So, I will answer them at the same time. I remember in 2012 when Jed Hoyer and Jason McLeod would talk about one of the goals of the farm system was to produce waves of pitching for the major leagues. Well, that time is finally here. It’s a few years later than expected but in 2019, there will be plenty of arms in contention to make it to Chicago next spring and summer. The main arm I see on the horizon is Adbert Alzolay. Alzolay missed most of the 2018 season just as it looked like he was figuring things out at AAA Iowa. In his last start in May, he took a no hitter into the fifth. It was his fourth such outing last spring. The Cubs shut him down in mid-June when his lat strain was not recovering. Alzolay continued to work hard and shared rehab stories and videos on his own Instagram and Twitter accounts. The Cubs would love it if Alzolay could make it to Chicago as a starter since he sits 95-96 deep into games. That sustainability is a key part of his likability but so are an improving curve and changeup. However, there is no spot for him in the rotation right now. Alzolay would be awesome coming out of the pen. When I first saw Alzolay pitch in 2015, it was a long reliever for Eugene. He was brilliant most every night for the Ems. Alzolay has improved since then. He would not have any issues transitioning to such a role. Alzolay is one arm I can see pitching in Chicago regularly in 2019. The other is Dakota Mekkes. The 6’7” behemoth is pretty close to ready. He’s dominated four levels the pasts two years as a pro with a 1.16 career ERA and 190 Ks in 147 IP. The former Michigan State reliever only needs to cut down on his walks and he could be a 6th-7th inning kind of guy to begin and he could also easily go 2 innings if needed. Alec Mills and James Norwood look to be names to know after getting a sneak peak in the pen last summer. Duane Underwood worked out of the pen some in Iowa after getting a spot start for the Cubs. And, as usual the past two years, Dillon Maples is still lurking. However, there is a new wave of arms who could be ready at some point in 2019. Trevor Clifton seems to be getting closer and closer as a starting pitching. Efficiency will be a key for him to get to the 6th and 7th innings on a regular basis. Duncan Robinson is not far behind Trevor in terms of experience, but his control and versatility could be a key to his arrival. I really like Michael Rucker as a swing guy who can start and relieve with his ability to throw strikes at almost a 70% rate and be in the mid 90s while doing so. Three guys could be longshots to make it this year. Matt Swarmer and Keegan Thompson both went through 2 levels last year at Myrtle Beach and Tennessee with great success. 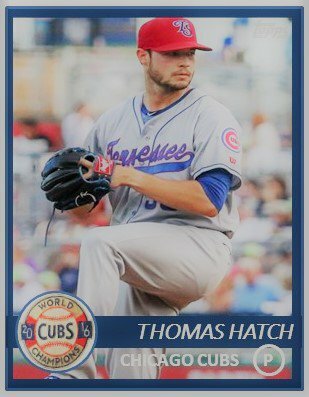 Thomas Hatch, the third, pitched like a man possessed in August with an ERA of 2.51 in 5 starts. Relievers Bailey Clark and Manny Rondon are still about a year or so away and Justin Steele is going to be the one I am going to keep an eye on the most at Tennessee to begin 2019. The lefty starter came back quickly from TJS and was dominant in the second half while hitting 95 most days to go along with his plus curve. The pitchers are coming. What I like most is that they are all so different. There is no cookie cutter approach. It should be fun to watch them get their shots in 2019. In years past, this article was spread out over two or three days. I would individually look at pitching, hitting, and relieving. It doesn’t need to be done that way anymore. Instead, today’s post will discuss how some parts of the system are trending. From AAA all the way down to rookie ball in Arizona, the Cubs have a plethora of starting pitching for 2019. It’s still a little uncertain as to who is going to pitch where next year, but the Cubs are awash with a lot of guys who could be back end of the rotation type guys. They’re only a handful of players who might be considered a 2 or a 3. The greatest aspect about the starting pitching strength is that the Cubs have a lot of depth. So much so, there are several arms who will be repeating AA and Iowa next year because of that depth. There are 15 names in play for the 10 spots at AA and AAA. Not everyone is going to make the cut to move up a level. As a result, that depth is going to trickle down and create somewhat of a log jam in the lower part of the system. It’s also going to create competition and we might see better pitching as a result. The second strength of the Cub system is its youth. The Cubs attacked the international free-agent signing periods from 2015 to 2018 with a lot of young arms and bats. Those players are just going to be reaching Eugene and South Bend in 2019. It’ll be interesting to see who keeps their head above water. In the summers from 2015 to 2017, the Cubs traded away a wealth of hitting and did not get any in return through the draft. As a result, they really don’t have a lot of impact bats in the system. 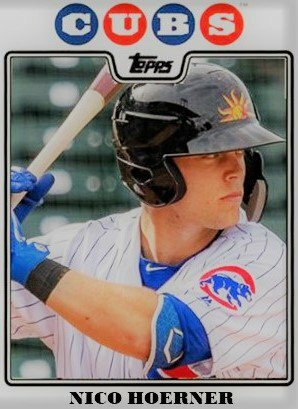 Zack Short and Trent Giambrone are nice surprises from those drafts, as well as Jared Young, but the Cubs are hurting for hitters from Myrtle Beach on up to Iowa. Last year saw the Cubs succeed with a few non-drafted free agents and the Cubs may be willing to go out and get more MiLB free agents to fill the middle part of their system. As well, the Cubs used three of their first four picks in the 2018 draft on Nico Hoerner, Cole Roederer, and Brennen Davis. All three, when healthy, seemed to have a pretty good first year in Mesa, Eugene, and South Bend. The Cubs may have one of the bottom five ranked systems in the minor leagues. They may lack your basic star impact prospects that we’ve seen in years past. But that doesn’t mean that the current crop of prospects is going to be bad. In fact, there a lot of prospects who should be MLB contributors in 2019. I can see Bailey Clark, Michael Rucker, and Dakota Mekkes pitching in the bullpen. I can see Mark Zagunis in a bench role. I can see Zack Short cranking out a home run or drawing a walk at Wrigley. There are several players who have what it takes. In getting back to the youth, that’s probably where the next Cubs’ star is going to come from. 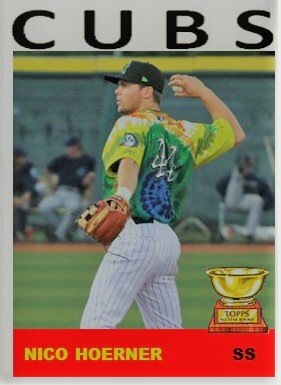 Right now, Nico Hoerner is a glow-in-the-dark kind of prospect. He’s shining bright in the AFL with minimal experience against elite competition. Nico’s time in the minors could be fast-tracked. Most of the Cubs MLB core is going to be playing on expiring contracts in 2021. The Cubs can’t sign them all so they do have some time to rebuild that system. The key is going to be the development of that youth the next two summers. Miguel Amaya, Brailyn Marquez, Cole Roederer, Nelson Velasquez, Brennen Davis, Luis Vazquez, Jonathan Sierra, Fernando Kelli, and Richard Gallardo are going to be the guys to watch turn into stars. At least that’s the hope for 2019 and 2020.